Focus. Capture. Enhance! There’s no better way to snap a photo than to use a camera that parallels with a DSLR’s quality. With the mobile’s Professional Dual Camera with Live Focus, this new smartphone can enhance every moment as it captures the depth and feelings of every photo, in any lighting condition. Samsung Galaxy J7+ can now dominate the mid-range market with its superb cameras and new photography features. And consumers are in for a big surprise when they discover how to avail one on a low budget: with Home Credit’s 0% interest promo this October to December! Samsung’s partnership with global Fintech company Home Credit has made this new smartphone available to more people – especially those who do not have credit cards. Now they can enjoy taking snapshots of the moments that are worth remembering. The Galaxy J7+ is the sleek, new competitor in the mid-range smartphone category that brings an amazing flagship feature to the J-Series lovers – Live Focus. Made possible by its Professional Dual Camera, the smartphone allows you to adjust the amount of blur on the background while shooting, so you can focus on the subject that matters. The new Selfie Focus feature delivers the same professional depth effect to Galaxy J7+ Selfies, while the built-in Mobile Photobooth feature uses Augmented Reality Stickers and Filters to make photos extra fun and expressive. With Performance+, the Galaxy J7+ offers multi-taskers a total performance upgrade with 4GB of RAM, and a fast 2.4GHz Octa-Core Processor, all running on the latest Android Nougat 7.1.1. Bixby Home gives users instant access to useful information with one swipe to the right - the calendar, today’s weather, popular attractions nearby, and frequently used apps. Enjoy the premium feel of the Galaxy J7+ with its Full Metal Unibody in Black and Champagne Gold. Equally premium, bright and vibrant, the display shows a 5.5-inch Full HD Super AMOLED panel, with thin bezels on the side that gives the screen a larger look – ideal for viewing photos and videos. For tech-savvy convenience, the Always on Display (AOD) allows users to control music, and see the most important notification at a glance, without unlocking the screen dozens of times a day. Dual Messenger allows users to create 2 messenger accounts, so that business and personal messages can be separated. Users can protect their private files with the Secure Folder which can only be accessed by their own unique fingerprints. The new device supports dual nano-SIM, with the second slot as a hybrid for either another SIM card or a micro SD card. A wise choice for a photo enthusiast is to go for the latter, because with Galaxy J7+’s expandable memory up to 256GB, there’s always enough room for high quality shots! Overall, Samsung Galaxy J7+ has considerably more advanced features compared to its predecessor Galaxy J7 Pro. And when it comes to enhancing every moment, that Professional Dual Camera is no joke – that’s an enough reason for Samsung to compare it with a DSLR! Samsung Galaxy J7+ takes snapshots to a whole new level, for only Php 19,990 SRP in all Samsung stores. With Home Credit’s 9 months 0% interest promo until December, it’s even more worth it – no credit cards needed, just 20 minutes of your time to process that low monthly installment. Applying for a loan with Home Credit is easy. Simply visit any of the participating stores, approach a Home Credit sales associate, present your two valid IDs, and submit your filled-out form. 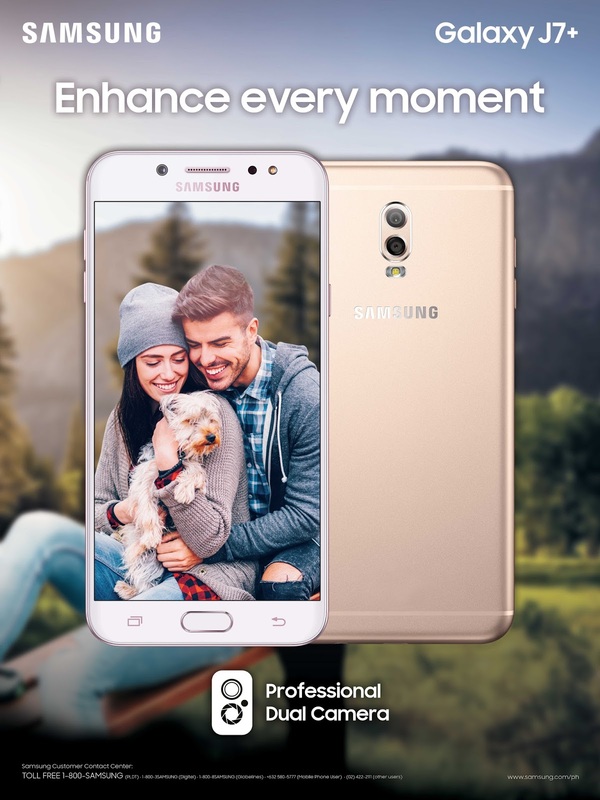 It only takes a few minutes to get approved, then you can bring home that Samsung Galaxy J7+ and start capturing your life’s sweet moments!